The Swollen Pickle mkII Jumbo Fuzz is the most sought-after and corpulent Way Huge guitar effects pedal, and now it's back! A charter member of the Way Huge line has returned, and just like when it debuted in 1997, it still has "more fuzz than a moldy peach!" The Swollen Pickle mkII doles out super high-gain fuzz with copious amounts of smooth low-end to all who dare plug into it. With a twist of the Sustain control, the Swollen Pickle mkII Jumbo Fuzz takes you from mild crunch to Armageddon. The Filter control retains its trademark insane range of heavily band-pass-filtered tones, distinguished by remarkable girth and sizzle, and the Loudness puts out enough volume to clobber any amp. 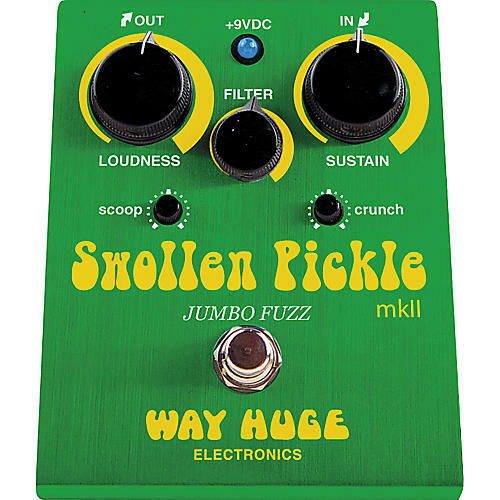 Updated Swollen Pickle mkII Jumbo Fuzz features include a tone stack Scoop control that elicits classic Swollen Pickle guitar pedal mid-scoop or a flat mid-frequency sweep, and a Crunch knob to adjust the compression intensity of the fuzz. Finally, under the hood, the Swollen Pickle mkII fuzz pedal has 2 internal mini controls-Voice sets the intensity of the external Scoop control from light to heavy mid cut, and Clip varies between two sets of clipping diodes for smooth or opened fuzz sustain. Each Way Huge effect pedal is rigorously tested to ensure quality, durability, and reliability to deliver many years of exceptional performance. All Way Huge pedals offer a heavy-duty footswitch with quiet relay-based true bypass, a blue LED indicator, 2.1mm power jack with AC protection, easy access (non-detachable) battery door, a super-duty .09 aluminum anodized chassis, high grade components, great tone, and a cool name. Launched in 1992 by Jeorge Tripps, Way Huge Electronics began as a result of Tripps' search for great tone, and his desire to perform with reliable, rugged and pedal board-friendly effects that had the magic of his coveted vintage pedals. The very first pedal-simply labeled "Fuzz Box"-was quickly followed by such staples to the product line as the Red Llama Overdrive, Foot Pig Fuzz and Green Rhino Overdrive II, which quickly found their way into the hands and onto the pedal boards of the world's guitar elite. Ensuing years would see the introduction of pedals such as the Swollen Pickle Jumbo Fuzz, Aqua-Puss Analog Delay, and the Saffron Squeeze. Over the span of a few years, Tripps helped revolutionize what would later be known as the 'boutique' effects market. In late December 1999, the company closed its doors as Tripps pursued other opportunities, sending demand for Way Huge products soaring, and driving online auctions well into the hundreds-sometimes thousands-for used Way Huge pedals. Now teaming up up with Dunlop, Way Huge pedals will once again be available to the masses, so all can enjoy their finely tuned electronics, high-grade circuitry and road ready construction, built under the watchful eye of Mr. Huge himself.